I just had to share one of my all time favorite Disney photos with you. I love this picture for so many reasons! It is as if she and Geppetto are all alone at the Park. I wonder what my sweet girl was telling him. I hope that you all had a fantastic weekend! Make it a magical week! Geppetto and his little friend are linked up over at The Things We Find Inside "I Love My Online Friends Hop." Head on over there, link up & hop along. You don't want to miss out on the fun so be sure to check it out. What a sweet picture. I can see why you love it! oh this is a great picture! I love this picture. 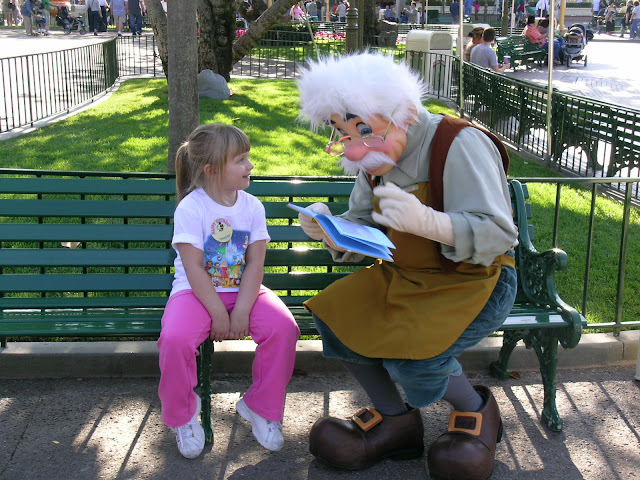 Geppetto is one of my all-time favorite characters. I hope we get to take my girls to Disney sometime! I hear about SO many fun experiences there! Aww..I've never seen that picture before! That's just heart-meltingly adorable and it makes me want a family trip to Disneyland. What a sweet photo and would make a fabulous layout. That is just adorable. Certainly a photo to treasure for years to come! What a darling picture, can't wait to see the layout!